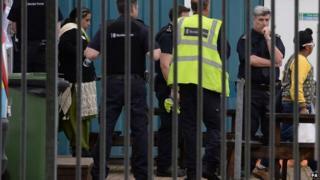 Fifteen of the 68 suspected illegal immigrants found in lorries at Harwich, Essex, on Thursday have been deported. The 35 Afghans, 22 Chinese people, 10 Vietnamese people and one Russian were found locked in four lorries at the town's port on Thursday. Immigration Minister James Brokenshire said the 68 included two pregnant women and two unaccompanied children. Four drivers from Poland were arrested and bailed until 2 July on suspicion of facilitating illegal immigration. Conservative MP for Harwich and North Essex, Bernard Jenkin, asked Mr Brokenshire in the Commons about the discovery of the migrants. Mr Brokenshire said several of them were complaining of chest pains and nausea. He said if any of the migrants claiming asylum were found to have made similar claims in other EU countries, they would be sent back to them. "Some of the individuals have claimed asylum and UK Visas and Immigration are considering their claims." he said. "Two of the asylum seekers are unaccompanied minors and have been placed into the care of Essex social services. "We have already begun the work to seek the removal of the remaining migrants from the UK and 15 have already been successfully removed." Mr Jenkin said the individuals found at the port were a "pitiful sight". They were as much victims of human traffickers as they were "seeking to exploit the system themselves", he said. How many 'clandestine' migrants come to the UK?